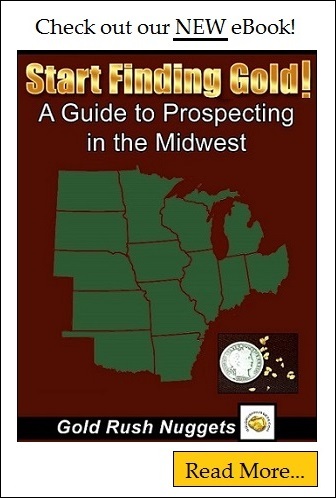 North Dakota has never been a significant producer of placer gold. Some of the earliest reports within the state caused some short-lived excitement, but the limited quantities of gold discovered have never been enough sustain much interest. Nonetheless, there are several locations throughout the state that are known to have produced at least a small amount of placer gold, which may be enough to interest some smaller scale recreational gold mining. The first reported discovery of gold in North Dakota was in 1887, when a prospector name William Gay found small specks of gold along the banks of the Grand River. There were also prior reports of small deposits found at Deep Creek in Bowmont County. These gold they discoveries only got passing mention, as the ground was not considered rich enough to be worked profitably. The extent of these placers is not well documented, but there have been no serious mining attempts in the area since that time. Gold has also been found near the Sheyenne River, and is found within cemented gravels. The source of this gold comes from the Black Hills in South Dakota, one of the richest gold regions in the world. Geologists believe that the gold bearing gravels were covered by deep layers of glacial sediment during the last ice age, and the gold bearing gravels are those that have been exposed by erosion from the Sheyenne River. Prospectors should search areas showing signs of erosion that has exposed these hard cemented gravels, which also occur above the river on buttes and ridges. One documented discovery of gold was located about six miles north of Fort Ransom. During the summer of 1908, a small group of miners staked claims in McHenry County, three miles east of Denbigh, North Dakota. They formed a mining company called the “Eldorado Gold Mining Company”, and worked the area for a short time. The mining didn’t last long, as they soon found the ground was unprofitable to work and was abandoned. Much like the other short lived gold ventures within North Dakota, the limited abundance of any gold did not cover the expense of operating a gold mine, and very little evidence of mining exists today. Several other gold mining ventures took place in North Dakota, some of which were actual discoveries and some were scams designed to fool potential investors. With these varying reports of potential gold in the state, a prospector would expect that gold would be easy to find here. The truth is that there is very little information pertaining to the extent of gold discovered. Even with the record high gold prices in recent years, there has been no commercial gold mining done in North Dakota. Of course gold is where you find it, and a prospector still has the potential of finding some gold here, even if only in limited quantities. Focus on these areas that have a history of at least some gold production and get out your gold pan!